Minimum age is usually 21. 3 years of investigative experience. Willing to work anywhere in the U.S. Pass a written entrance test. Minimum age is usually 20 or 21. Willing to work anywhere in the state. Most agencies require that you be a U.S. citizen. It does not make sense that you could not be a U.S. citizen yet you enforce the laws of the United States. However, there are a few local police departments that do not require U.S. citizenship as long as the applicant has a work visa or green card and has applied for U.S. citizenship. The minimum age usually corresponds to the law that you have to be a certain age in order to carry a firearm. In addition to the written test, some departments give a video test. The video portion of the testing is based on law enforcement related scenarios that focus on quick judgement and common sense. You watch the video and then answer multiple choice questions as to what you would do. 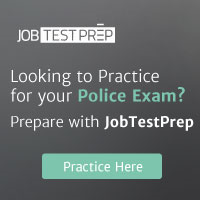 All of the answers can be derived without prior police training or experience.